Thursday April 25th is a night for all Cranberries fans! Limerick’s esteemed music store Steamboat Music want to gather all fans to honour the release of The Cranberries final album ‘In The End’ releasing Friday April 26th. The event will be taking place in Dolan’s Upstairs venue and will be an amazing opportunity to hear the new album before its ofﬁcial release with a panel discussion from some very special guests. Fans can gain access to the event by pre-ordering the album from www.steamboat.ie and this will guarantee entrance to the event Upstairs in ‘Dolans’ Limericks iconic venue, numbers are limited. Limericks finest and most iconic band will be honoured through the night, fans will be welcomed into the venue on the night at 9pm to a wealth of great Cranberries tunes, followed by a panel discussion on the bands history and impact this band from a small town has had on the music industry. Niall Colgan, a close friend of the band will MC the event. The discussion will feature Deci Hogan (The Cranberries Stage Manager), Eoin Devereaux (historian and writer of liner notes on previous Cranberries albums) and Orla Colgan (Dolores O’Riordan’s secondary school music teacher), fans will then get to hear the new album will then be played in full through a top quality sound system prior to its world-wide release on Friday April 26th. 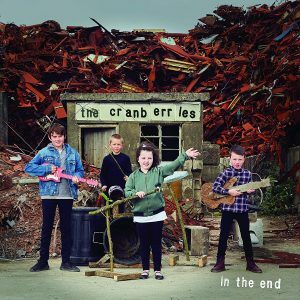 The new album ‘In the End’ is a collection of songs the late Limerick legend Dolores O’Riordan worked on prior to her tragic passing last January. “We knew this had to be one of the, if not the, best Cranberries album that we could possibly do”Noel Hogan, band mate said in a statement. Hogan and O’Riordan started work on the songs in May 2017 and had written and demoed 11 songs by that winter. “I can’t think of a more ﬁtting way to commemorate the ﬁrst anniversary of Dolores’ passing and to celebrate her life than to announce to the world the release of her ﬁnal album with the band,” Eileen O’Riordan, Dolores’ mother, said in January.